TODAY OFFERS ME A chance to watch Apple's trainers explain how to efficiently produce content for handheld devices. While that workflow might be useful to me, I'm more interested in discovering efficient ways to leverage my current laptop set-up in converting third level educational multimedia for trackable use on all sorts of pocket media platforms. I teach in a third level classroom where fewer than half of my first year students have played a video on their mobile phones. Fewer than 10 per cent have listened to downloaded audio on their phones. Until this year, none of my 61 new students had browsed to a link list containing lecture materials using just their mobile device. Learning how to serve this kind of third level cohort by providing rich media in students' pockets means I'm targeting a group of students more than two years away. Simply put, my students have neither the money for the upgraded handsets nor the motivation to use them to consume essential learning materials. I hope both of those factors change so I can provide an enhanced learning environment for the 2020 workplace. But I actually believe I'm that far away--it will be 2020 before a majority of my newest third level students arrive on the first day of the term with upgraded pocket media and the desire to want to leverage that gear for best effect while immersed actively in education. 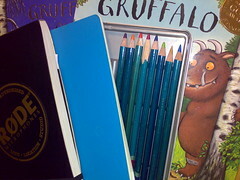 In the meantime, I'll train for the future, using The Gruffalo, some sketchpads, designs scribbled in Moleskines and a few artists' pencils while learning how to produce things the Apple Way. Audio: Learning the Apple Way. Sent mail2blog using Nokia E90 O2-Typepad service while meandering towards centre city Dublin, Ireland.